It’s hard to imagine that a cocktail would create legal controversy, but that is exactly what the classic Dark and Stormy has done. According to legend, the cocktail was first invented just after World War I on the Caribbean island of Bermuda. Since then, a Bermudan spirits producer has filed a registered trademark of the drink’s name and has sued or threatened to sue several other spirits makers and even a popular cocktail recipe blog. While the recipe for a Dark and Stormy is easy to master, the cocktail is anything but simple. In 1991, Gosling Brothers, Ltd. of Bermuda filed a U.S. trademark for the name “Dark ‘N Stormy”, using one apostrophe in the trademark registration. The company even filed a specific recipe for the cocktail, which includes only three ingredients. Since then it has sued or threatened to file litigation against several other manufacturers and cocktail enthusiasts. Gosling Brothers chose to trademark the name Dark ‘N Stormy to prohibit the marketing of the drink unless it was made with the brand’s own Black Seal rum, which is characterized by a jet black color and a rich charred-molasses flavor. The International Bartender’s Association uses two apostrophes when discussing the cocktail, as in “Dark ‘N’ Stormy”. Enterprising mixologists have come up with subtle variations on the trademarked name, or have developed similar names like “Safe Harbor”. 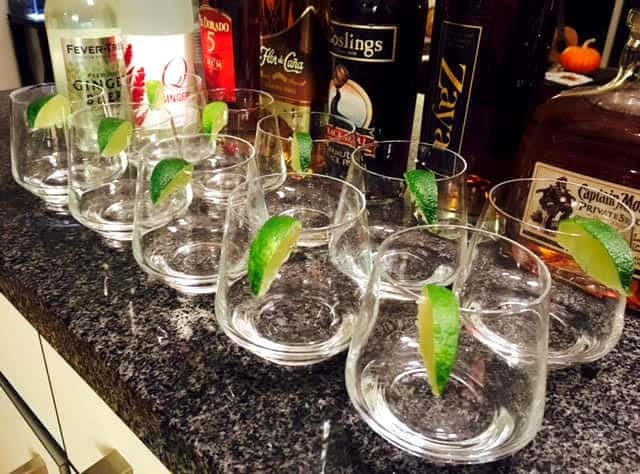 Modern interpretations – perhaps even considered “illegitimate” variations — may substitute other types of rum or use lime juice (fresh or bottled) in addition to or instead of a lime wedge garnish. Today’s Dark and Stormy is made with the same ingredients, the key here being the use of a dark, complex rum. Ginger beer can be had in many well-stocked grocery stores; this is different from ginger ale, as the ginger beer has a fuller, spicier flavor. In a highball glass filled with ice, pour in the rum, then fill the glass with ginger beer. Squeeze the lime wedge into the cocktail, then drop the lime wedge into the glass. Professional bartenders like the experts at The Bartender Company in the San Francisco area use freshly squeezed juice instead of the lime wedge and add a couple other “secret” ingredients. Others may simply garnish the glass with the wedge. However you spell it and however you make it, the Dark and Stormy blends autumnal and summer flavors into one refreshing cocktail favorite. Continue Reading: Mixology Classes, Online or In Person?